It is time for another Stamping In Time Challenge (SNTODBD10)! Silke Ledlow is our challenge hostess this month! Silke is challenging us with a sketch! It is a high and low card or tall and thin. Your choice! However, it is not an A2 or a square card sketch! Good luck and have fun with it! To see the other DT creations for inspiration, please visit the following DT blogs! 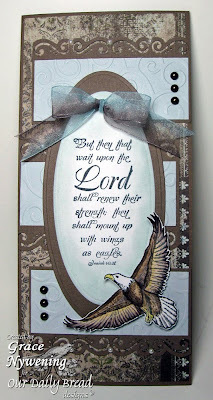 I used Our Daily Bread design's On Eagles Wings. The base is Bassill, the soft blue is from my stash, the sentiment is on vintage cream, and the designer paper is BasicGrey Periphery. I love the soft muted shades in this card. I colored the Eagle image with Prisma Pencils and cut out, popped up on dimensionals. I used the Spellbinder's Long ovals for the sentiment. I added punched edges with an EK Success punch and some pearls and I textured the blue panels with the CB Swirls folder. The ribbon is from my stash. I hope you enjoyed this card.... the verse is among my favorites... Is. 40:31 But they that wait upon the Lord shall renew their strength; they shall mount up with wings as eagles... they shall run and not grow weary, they shall walk and not faint. Absolutely Wonderful Grace!!! Love the rich chocolate with the soft blue and all the border punching! The eagle looks stunning! Grace, this is just beautiful! Wonderful colors and the sponging just illuminates the scripture beautifull! Wonderful card! This is wonderful. The design and the colours you have chosen are lovely - as are the sentiment and the eagle. Beautiful card, so elegant! Thanks for joining us at Crafty Creations Challenge! Good luck! A beautiful majestic creation, Grace! The sentiment just glows! This is outstanding, I love it!! Ohhh wowww Grace,what a beautiful card. I love that your work is so full of heart and that you use your art to give glory to our Lord. Thank you for blessing me today. This is just lovely. Thanks for sharing at WhoopsiDaisy this month. Thank you for joining us at 'The Crazy Challenge' this week!! This is absolutely stunning Grace!! I just love your take on that sketch, the blue and brown combo, and the eagle. Gorgeous job my friend. Love it!! I always struggle with tall and thin..This is beautiful. I love the panels you used. Great job..Hope all is well with you..
What a gorgeous card, Grace!! I am drawn to the scripture right away, so you sure did something right to highlight this!! The layout and design is perfect with this verse too!! Thanks for sharing your lovely work and encouraging card!! Grace this is a beauty. I love the verse you have used and I really must get myself an eagle stamp - it adds such impact to the sentiment. The colours are lovely - strong but not overpowering. Love all the punched touches too and the lo complements the card shape to perfection. What an incredible, powerful card!!! you really rocked this sketch, Gracie!!!! Love ya, sister!! One of my favorite Scriptures! This is beautiful as it really exemplifies the Scripture! This card is stunning! I love the gorgeous color combo..everything about the card actually. Thanks for playing with us over at Practical Scrappers this week. Thank you for playing along with us at "Crazy challenge"! Great card, so different! Awesome!